Is that time of year when New World School Arts show cases its top artists, musicians, thespians and dancers. In the past artist that have taken part in this event went on to become stars in the Art World. Miami first witnessed the talents of artists such as Jen Stark, Hernan Bas, Bert Rodriguez, Naomi Fisher who have all set foot in this event when they attended the prestigious school. The pinnacle of New World School of the Arts 25th anniversary celebration will be the acclaimed Rising Stars Showcase, a professional exhibition and performance, showcases the remarkable talent of high school and college students from New World School of the Arts, Florida’s premier arts institution. This Broadway-style extravaganza is an energy-packed, one-of-a-kind performance that will undoubtedly captivate the audience withexhilarating works of art, and enthralling dance, music, and theater. The Program: Sponsored by Bank of America, The Rising Stars performing arts showcase will highlight the talents of its high school and college students in both the performing and visual arts. The three-part celebration launches with an artexhibition focused on the theme black and white. The artwork, specifically curated for Rising Stars, includes creations by both high school and college students. The New World Gallery show is followed by a performance of dance, music and theater at the Gusman Center for the Performing Arts. The performing arts lineup includes excerpts from the musicals Spring Awakening by Steven Sater, and Jeffrey Lane’s Dirty Rotten Scoundrels presented by the Theater division. The NWSA dancers will delight the audience with Jazzapaloosa, peformed by a troupe of 11 dancers as well as a special presentation of Martha Graham’s Prelude to Action. An excerpt of Beethoven’s Fifth Symphony and Symphonic Dance No. 3 Fiesta by Clifton Williams will round off the Rising Stars performance. The evening celebration will continue with a 25th Anniversary Party at the New World Dance Theater immediately following the performance. 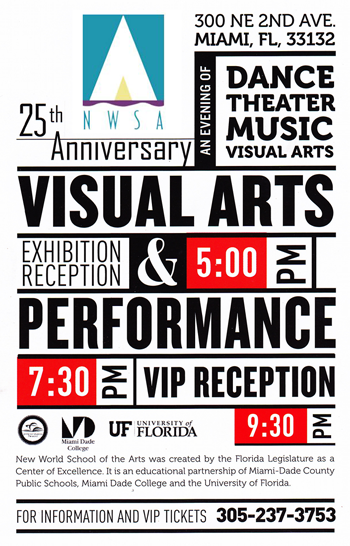 Guests will have an opportunity to mingle and continue the merriment during the 25thAnniversary Party to recognize the artistic and academic achievements of NWSA students, alumni, administration and staff during the more than two decades the school has existed. NWSA Rising Stars Alumnus Award: The NWSA Rising Stars Alumnus Award is presented each year to a high school or college graduate from New World School of the Arts, who is successfully contributing to his or her art form. In selecting candidates for this prestigious recognition, the NWSA administration and deans of the fourarts strands convene and evaluate each nominee’s artistic achievements, as well as their growth and development as artists. One alumnus is then selected torepresent one of the divisions. Tarell Alvin McCraney, distinguished international playwright and NWSA 1999 alum, will take center stage as he comes back to his alma mater to receive this honor from the hands of his former dean, Patrice Bailey. via nwsa.mdc.edu – Spectacular “Rising Stars Showcase” celebrates NWSA Silver Anniversary.